Earlier this year we had a change to product 72-3299. This trim had a 16mm return which could be adjusted to 13mm by way of a scored leg which could be snapped off at 13mm. The ability to adjust 72-3299 was removed in January. We have good news! A new 13mm only Archway L Bead has just landed at Wallboard Tools. 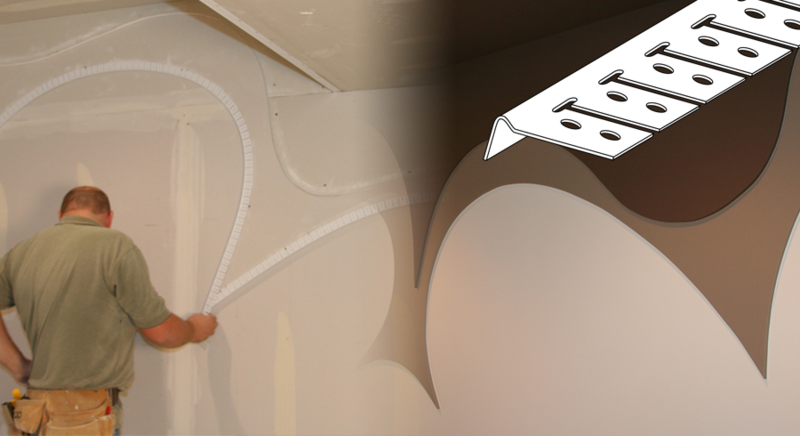 13mm Trim-Tex Archway L Bead is designed for finishing columns and free form plasterboard design features. It’s made from lightweight, flexible PVC and create curves with a 450mm outside or 300mm inside radius. While 13mm Archway L Bead is a great solution for around duct work, piping or curved walls it really comes into it’s own when producing layer features using 13mm plasterboard. 13mm Archway L Bead has a 28mm mud leg and is available in a carton of 50, 3 metre long pieces. This trim is installed with Trim-Tex Adhesive Spray and 10mm staples. Ask your distributor about this new bead today by quoting the product code 72-3288. Find out more about the entire Trim-Tex range from your local Wallboard Tools distributor or by reading more here. Stay up to date with the latest news and new products by heading to our Facebook page and hitting the “like” button.